Top Questions answered if you scroll down this description! I get a lot of questions about the rocks. The rocks were for holding the barbed wire down, which is hard to make out unless you are watching in 1080. The barbed wire acts as a bond between the layers. I also get a lot of questions along the lines of "why not use logs!" 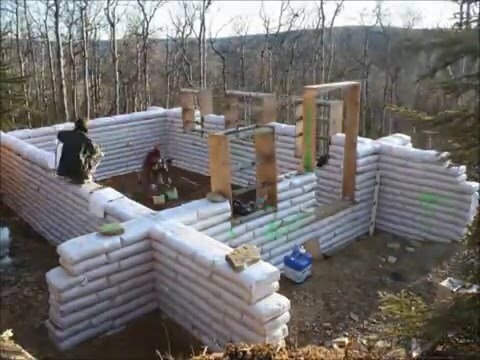 The logs you see on the property are not suitable for cabin building, and buying logs is really, really, really expensive relative to earthbag construction. Also, we were just really curious to see how such a building would fare in Alaska. -Yes, it's still standing. We did a lot more work to it and lived in it for 3 years. We sold it this fall. -I am working on an update video. It will go up sometime in November 2016. Since it's mostly stills I'm having to dig through about 65 gigs of pictures to put together a decent time-lapse, but I am working on it. You can also put "earthbag construction" into your search bar and press enter. I guarantee that will be faster than leaving a question in the comments. We bought our bags from Pacific Packaging Industries in Portland, OR. We talked to several great suppliers but PPI managed to get us the best deal on shipping.